The RX 490 will target the 4K resolution. Image for illustrative purposes only. We told you about the RX 490 approximately 4 months ago and how it is expected to launch by year end. Well, we have just received further reports that the card will not only be announced in December, but will be launched in December as well. In fact, it will be announced and launched on the very same day – so we are not looking at a soft or paper launch but an actual release day in the very near future. The card has been listed on AIB websites (and even AMD Official) for quite some while now – so everything appears to be ready. The RX 490 will be AMD’s 4K ready flagship that will be taking on the GTX 1080 at a (probably) similar price point. It is going to be the crown jewel in AMD’s RX lineup. The existing Polaris based lineup currently maxes out at the Polaris 10 based RX 480 – which is roughly equivalent to the GTX 1060 in terms of graphical performance. According to AMD, Polaris 10 is the largest 14nm FinFET GPU available right now and that raises interesting questions what we can expect from the RX 490. It will target the 4K resolution and be the go-to graphics card for VR. It will have a bus width greater than 256 bits. It will be based on either a dual-GPU Polaris 10 design or Vega 10. AMD has been very tight lipped about the whole affair and has so far managed to avoid any leaks to the press. Since the expected announcement is so close anyways, we will find out the full details in December. We have already leaked a roadmap for AMD’s upcoming GPUs for 2017 and 2018, and we can see that the company is taking its dual GPU designs very seriously indeed. If the card is indeed based on Polaris 10 then we are looking at a net total of 4609 stream processors – more than enough to drive the 4K resolution. Also keep in mind that since the card is especially focused towards VR, dual-GPU solutions have a unique advantage since they can dedicate one processor for each eye. With advances in DirectX 12 API and Liquid VR (check out our exclusive interview on LiquidVR) making seamless execution of code on a dual GPU that much more easier for devs, it would be an ideal candidate for a truly “VR” focused GPU. We have done a pretty thorough analysis of all the hints previously and I am of the opinion that the evidence in favor of it being a dual GPU Polaris based affair is much greater than Vega coming early. That said, it is entirely possible that Vega has been fast-forwarded and is now ready to ship under the RX 490 brand name. An overview of our original analysis is given below for those who want to read it again. Candidates for the RX 490: Vega 10 or Dual GPU? The biggest hint to the nature of the RX 490 comes from these Zauba shipment manifests and one RRA certification that we spotted and analyzed a few months ago. These contained multiple variants, all of whom have been accounted for except one. This variant has not yet been identified and is quite possibly the RX 490. Dubbed the “C99” variant hereon, all of the evidence on it point to the fact that we are looking at a dual GPU solution, probably one based on a full version of Polaris 10. The only other alternative was that the C99 variant is Vega 10 but there are some gaping holes in that theory that in my opinion put it at a much lower probability: 1) Vega 10 by recent reports was too early in the development stage to have made it out to the FOC testing phase (the shipment manifest was dated July 2016). In fact, if I were to offer some proof: the C99 board passed RRA certification on 8th April 2016 which was way before AMD celebrated the Vega 10 GPU development milestone! 2) The nomenclature indicates a Polaris card. So we know for a fact that the C99 board has yet to be accounted for. We know that its insurance value is equal to roughly double of the RX 480. We know that the nomenclature indicates a Polaris GPU yet Polaris 10 is the full fat chip (meaning there isn’t a more powerful Polaris variant out there) and finally, that it passed RRA certification way before Vega 10 was anywhere near completion. 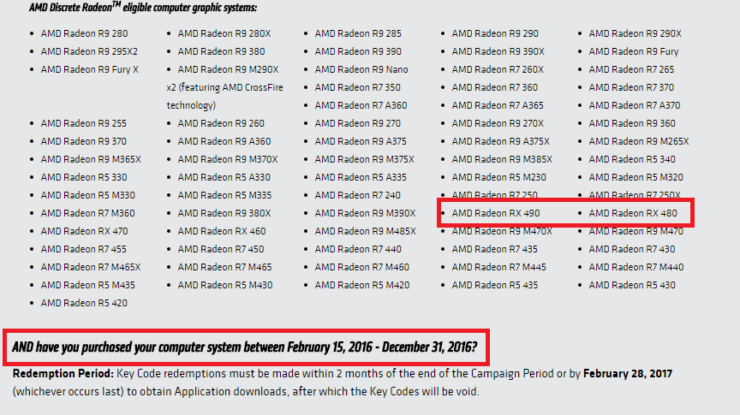 In fact, the only way the RX 490 ends up being a Vega 10 GPU (assuming AMD did not fast-track it) is if it arrives next year (which would mean that the C99 board will be called something else), which doesn’t make a lot of sense considering its (RX 490) listing has popped up in AMD partner AIB sites as well. As far as the pricing or the exact specification goes, we don’t really have much information on that count. Keeping in mind AMD’s strategy however, I doubt the card will be priced in the same range as the Radeon Duo Pro and I definitely would not be surprised if it is priced close to the GTX 1080. AMD has previously stated that two RX 480s can beat a GTX 1080, and it is possible that this innocent enough statement was a big hint to what was coming sooner rather than later.